Rainbow trout first captured my imagination in sixth grade when I filled an aquarium at school with a few dozen fingerlings. Most of them went belly up, but the hardiest survived to become silver streaks of excitement for Middle School boys with their faces pushed up against the glass. Here in Washington State on the dry, eastern side of the Cascade Mountains, we have a species of trout variously called redside or redband. In fact it is a subspecies of rainbow adapted to live in the desert canyon country of the Pacific Northwest, a harsh environment of fluctuating river flows and oscillating weather extremes. The common names derive from the intense rosy blush coloring the fish's gill plate and flanks. These rainbows, I discovered soon after moving here, flash gorgeous colors and fight like hell. Most of my fishing for redsides has been in the Yakima Canyon, a drainage severely compromised by dams and irrigation which some anglers refer to it as "the ditch." But that ditch's trout mesmerized me from the get-go. I had fished for rainbows all over the country, and though these particular fish rarely attained the size of rainbows I had caught up and down the fertile streams of the Rockies, they seemed to me more beautiful and pound-for-pound better fighters than their compatriots elsewhere. My suspicions about the Yakima's rainbows were confirmed several years ago after meeting a state fish commissioner around the campfire one night. He told me that contrary to public perception, the Yakima's rainbows are hardly the mutts most people think they are. Years of stocking for a "put-and-take" fishery ended in the early 80's with new selective gear rules that culminated with "catch and release" designation in 1990 (those wanting to keep a fish can do so below Roza Dam). Now the fish are strictly wild—that is, self-sustaining. More than that, DNA tests proved that years of stocking hadn't fundamentally changed the river's native trout. Apparently the natives didn't find the stockers attractive or fit for breeding. "You're catching 'bows descended from the same fish that Lewis and Clark caught," the commissioner told me. If only this were true for other watersheds. 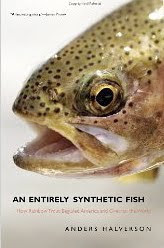 As Anders Halverson explains in An Entirely Synthetic Fish, his book tracing the remarkable journey of the rainbow trout, from its origins in one of the nation's first hatchery programs to its subsequent spread around the country and the world, the success of the rainbow has had a greater impact on fish and fishing than anyone could have predicted. Rainbow introductions created fisheries where none previously existed, helped to initiate countless young anglers, and altered ecosystems. With echoes of Michael Pollan's Botany of Desire, Halverson shows that not only have we engineered a fish but that the fish has also engineered us. The story begins with Livingston Stone, a New Hampshire pastor turned aquaculturist. In 1872, with orders from his boss Spencer Fullerton Baird, head of the newly hatched U.S. Fish Commission, Stone went west on the transcontinental railroad to San Francisco, then traveled north to the upper reaches of the Sacramento Basin in the shadow of Mt. Shasta. Here, within an arrow shot of the Wintu Indians, he set up shop on the McCloud River with hopes of propagating chinook salmon. The salmon hatchery didn't pan out but further upstream he met success with another North Pacific species, the rainbow trout (Oncorhynchus mykiss). By 1886 the U.S. Fish Commission had sent rainbow trout to 33 of the 38 states then in the Union as well as England, France, Germany, Switzerland, Canada, and Mexico. In time the fish would establish populations in South America, Australia, New Zealand, Asia, and Africa. Rainbow trout would become a "global species, both physically and culturally," remarks Halverson. "The range expansion that corn, sheep, dogs, and humans only achieved over thousands of years, rainbow trout have accomplished in little more than a century." The author goes on to examine the concurrent rise of recreational fishing, suggesting that such a rise might not have been possible without the adaptability of rainbow trout, for the sheer numbers of modern anglers require a hardy fish that can be produced—or reproduce on its own—in quantity. Hence the proliferation of hatcheries around the world, for good or ill, and the current debate over wild fish versus man-made fish. The rainbow's ascension occurred during a time when the control of nature seemed not only possible but preferable. Massive dam projects changed the face of the American West in particular, and where warm, muddy rivers once flowed there were now dam-controlled water courses with clear, cold water—prime trout habitat. Halverson details one of the more unseemly chain of events: the poisoning of the Green River (tributary to the Colorado) and its native "rough fish" to make way for sport fish like the rainbow. The poisoned fish now reside on the Endangered Species list. As the Green River episode illustrates, the rainbow's success has come at considerable cost. Rainbow trout now compete with native fish on nearly every continent. They're also used as compensation for degraded habitats. Throughout the 20th century it was commonplace to erect a fish hatchery where the assault of pollution, resource extraction, and development made natural fish propagation an impossibility. On the other hand, one wonders how many of today's river stewards were first lured to the joys of fish and fishing by the leaping rainbow. Anglers and history buffs alike will tie into a good story with An Entirely Synthetic Fish, a story that is both peculiarly American and also global in its lessons. After all, China is the new frontier for trout fishermen. I love the post, and I love the fish, too! I would like to point out that rainbows are of Oncorhynchus, that amazing genus of Pacific salmons, some of the greatest fish in the world! We have no true, native trout here on the West (that I am aware). Josh - That's true! Rainbows are not technically trout due to recent re-classification, at least not in the same way that browns are trout. But I suspect most folks will continue to use "brook trout" rather than "brook char" and "rainbow trout" rather than...I guess there is no other name. Maybe "rainbow hooknose"? BTW, Halverson says as much in his chapter on the rainbow/steelhead's tortuous name game. As usual, fascinating encounters of the word from the wild. I caught some of your pointers over on the Cascade Myco board (temple-talker). There's one feral frond that I'm madly obsessed with finding; the elusive wild asparagus. Do you have any experience with said? Technically Cutthroat are pacific salmon as well, not trout. Cutthroat are in the genus Oncorhychus just like Rainbows. True trout are in the genius Salmo (like brown trout). That said I'm still going to refer to them as trout, just like I do with char - at least in casual speak.